Dylan Kerr’s resignation as Gor Mahia’s coach on Thursday 15th November shocked the K’Ogalo faithful. But what really pushed the Briton to the edge? Futaa has unearthed shocking revelations of Kerr’s tribulations at Gor Mahia that played a big part in his resignation despite his notable achievements since joining the 17-time Kenyan Premier League champions in 2017. According to sources, a number of issues ranging from salary arrears and poor living conditions forced out the coach who had very quickly become a fan favorite of the Green Army. The club had failed to pay Dylan Kerr even a single cent for four months and there was no hope by the time he left. Close sources indicate that the Briton was going through a rough patch financially and a lack of water and electricity at his Kileleshwa apartment due to rent arrears was a testament to that. The lack of water in his house forced him to take showers in a swimming pool around the area. The Briton was a regular visitor at a Kibanda in Kilimani near Yaya Centre, not because he liked it but because his pockets could not allow him to have a proper meal at a proper place. In fact, things were so tough for the coach to the point he could not buy a new phone after losing the one he was using to thugs. It took the efforts of two unnamed players to pull resources and get him a new one. 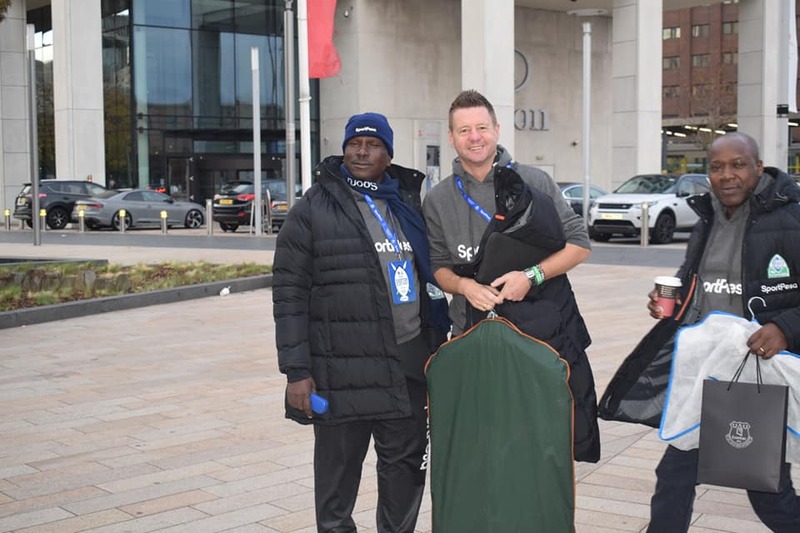 As petty as it might sound, Gor had transformed their coach into a trekking machine, by the time of his departure, Dylan Kerr did not have a car of his own or one provided by the club making his movements to and from training a difficult journey – most times, the 51-year-old was forced to trek from Kileleshwa to camp Toyoyo for training. Kerr’s close relationship with former AFC Leopards coach Rodolfo Zapata and newly appointed Sofapaka coach Melis Medo might also have played a role in his departure. The two were being taken good care of by their respective clubs and that left the Briton wondering why his club was treating him badly. The Brit will go down in history as one of the most successful Gor Mahia coaches ever having won the Kenya Premier League in his debut season and defending the title the following year. Kerr will also take credit for guiding K’Ogalo back to continental football. Hehehe, awuoro…….sheer nonsense ! Kerr should understand kiswahili phrase ‘mtu ni watu’ …salary arrears and poor living conditions is something we have lived with in kogallo for decades so who was he to expect something different ? Let him leave us in peace……. Awuori Jokoyo…..imadho mane? Ulimo gi Zico e din achiel. Haki Wewe Ni Punda. An Idiot. Moving forward, none of Gor Mahia coaches should undergo such harsh conditions. Such inhuman treatment under the watch of Raila and Rachier. That’s the aftermath of human worship, God will severely punish these two leaders,watch this space. @Jamriambo, Omera ng’ama teni ema iteno……Kerr should bear with our conditions, just like we tried to bear with his demands. Secondly, though this comments are not coming out of his mouth, Wach en gi teko,….He should at least come out and dispute this shocking and damaging reports that is really embrassing our brand. Just give me a local coach to coach me. Mambo ya ma foreign coach na players tusare. Wanna Sosi chapa tu. Fala ni wewe buda; what is it that Kerr did during our practices that a local coach can’t do? Nothing special buda. You can ask the other players and if they are honest, they will agree with me. @Gor Player, Which local coach has a CV that matches that of coach Dylan Kerr. Cheap is expensive. If you need a quality coach, you have to dig deep into your pocket and pay. Similarly, don’t despise foreign players, nobody can dispute the fact that Meddie Kagere was a quality striker, same to Jacques Tuyisenge. Kerr did nothing to prepare us that a local coach such as Kimanzi can’t do. Bro, resumes and TV’s can just be padded with sweet words. Gor Mahia Organizing Secretary Judith Nyangi was this morning arrested for allegedly defrauding a fan by the name Dave Last Born Ksh 60,000 and is currently held at Buruburu Police Station. Dave reportedly gave Nyangi the amount to help her secure a return air ticket to Algiers, Algeria for him for the Gor Mahia’s final group match of the CAF Confederation Cup against USM Algiers in August this year but this did not happen. “Nyangi told me that the Football Kenya Federation president Nick Mwendwa had given her two return tickets to Algiers and that she could give me one at Ksh 60,000. “At that time the cheapest return ticket to Algiers was going for 110,000 and so I sent the amount via MPESA. Unfortunately after paying her, she started taking me in circles, forcing me to cough up Ksh 190,000 to secure another one. “After returning to Kenya, she promised to refund me the money but nothing up to now. She has since refused to pay saying she does not owe me any money,” Dave told Kahawa Tungu. According to Dave, Nyangi has been bragging that she is close to the Nairobi Governor Mike Sonko and no legal action can be taken against her. Meanwhile Jakoyo can see what his Protege type of people are upto? Defrauding K’Ogalo fans of their hard earned money..Such characters like Judith Nyangi don’t merit GM leadership roles no matter how many votes they garner in elections if brand GM is to be pretected. I suspect this Gor player must be shakava, we have not forgotten his words about best defender selection. After failing to impress he started asking questions and said that Gor player should have won it.An average player who cannot grow after years of trust by Gor coaches. Who will arrest Aduda and Rachier for poor leadership and corruption? i like it when people here ignore @jakoyo.always negative pls bloggers let us make him happy by not replaying to his negative comment unless he post something positive worth commenting on.there was a time jakoyo was ignored and he started giving constructive comments,@ingo was ignoredand is no longer commenting.let continue with positive critism most bloggers here spew.this season naogopa tu sana.does any onethink we are going to get any silverware? Let’s cut our coat according to the size of our cloth.Trim EC to 5 maximum of officials,weed out “passengers” and trim players to 25 maximum,try out a African head coach e.g Ugandan/ Zambian BUT GET RID OF MUGABE AFTER HE HAS ACCOUNTED FOR GM MONIES! @jasego The Problem With Gor Mahia Is Ambrose Rachier, Who Is The Head Of The Gor Cartel. If You Cant See This Then You Are Part Of The Cartel. The Tendency Of Forever Blowing Your Own Trumpet N Pushing Personal Agendas Only Goes To Confirm Our Worst Fears. I ask again , who is jasego and why is he so Nagy and antagonistic just like our kenyan politicians? I ask because I miss the good old days of intellectual and open debates from the likes of ogango trailer, marto original, oduor12, dan original, Joe Riga and the insider jakoyo. Whoever you are jasego, I think I will ignore you because you are worth the ignorance. You nag and gag people as if you are their baba na mama and it is for that reason that perhaps intellectuals that we have known over the years have stopped posting insightful debates on this blog . so for that reason I will also join the exit group and leave this blog to weird political characters like yours. Please try it in politics, We are not fools. I believe we all love the club and are frustrated by the way our office handles issues. We have very many of our fans who have proven-records in management, be it PR, Finance and even general management. The only problem is that if they were to present themselves for election we will be the first one to trash them. It seems we are comfortable with the status quo. Begging bowl at hand at all times. Let’s embrace Jasego, Jakoyo . Oduor12 amongst others contributions without any bias. Some of them could be having insider info while others it could be basically the love for the team. My big concern is that is there anything going on currently at the club? Our opponents just played two games in Tz with identical nil nil draws against Simba and JUK. On issues of Kerr we need to move on , even Nutall with the unbeaten record left and we still managed to make another milestone in CAF. God willing we will better last season’s performance. All that is needed is cool minds, though the office needs to be restructured and with new offices with modern 21st century ideas on how to run a club. jasego, who among the Gormahia Fc Foreigners Is Leaving? Jasego respect yourself in public and people will respect you…..we dwanyri marach kamano, awuoro . awuoro…went to my first Gor game in 1969 – vs. Ismailia of Egypt. It was a very hopeful time BUT at this rate; almost 50 years later, we will continue to scratch the ground with the chickens (read – AFC) when we could have been soaring withe Eagles like TP or Mamelodi..
Why are Messers Ja’Asego and Oduor12 being lynched in this wall? Are they responsible for our current cycle of troubles or are we in the business of scapegoating as usual during times of crisis?